The Wizards hope their new coach can find the same kind of success developing young stars as he has shown so far in his NBA coaching career. 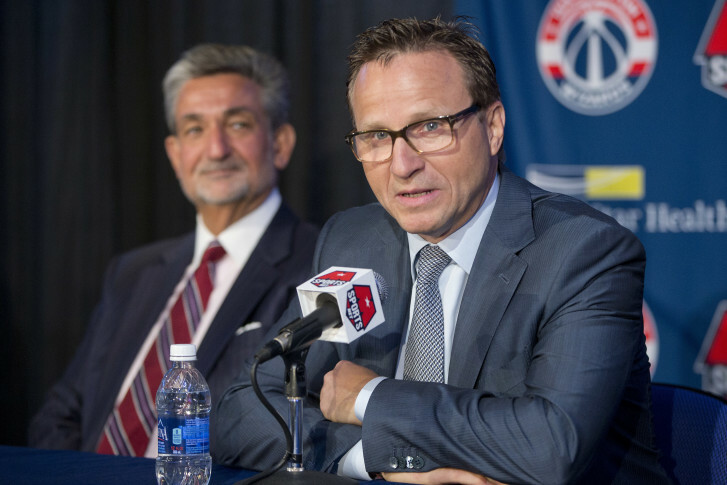 WASHINGTON — With a resume loaded with coaching success, including five playoff appearances in seven seasons with Oklahoma City, Scott Brooks had options. At last season’s end, the Wizards quickly pursued Brooks to be their next head coach and he readily accepted. The 2016-17 Wizards’ journey will again center on the continued development of three-time All-Star Wall and Beal. Together, they have the potential to be one of the elite guard combinations in the NBA and their potential has only been muted by injuries. Wall has stayed healthy, but Beal last season was forced to miss 27 games. In a season where the Wizards finished 41-41 and only missed a third consecutive playoff appearance by three games, it’s hard not to wonder what might have been had Beal been able to stay on the floor for more games. It is also worth noting that regardless of Beal’s health, the Wizards of 2015-16 did not have the edge and defensive intensity that brought them past success. To arrest the Wizards decline, Brooks made it clear he wanted an emphasis on defense. The opening days of training camp in Richmond, Virginia, were almost exclusively spent working on team defending. Previous head coach Randy Wittman’s development of the Wizards into a good defensive team seemed to get lost last year in a transition to a more up-tempo offense and an experiment with small ball. Brooks believes the Wizards have the commitment, length and athleticism to be, in his words, “intimidating” on defense. Half-court defense starts at the point and Wall’s ability to disrupt opposing point guards will be critical. Communication will also be essential in a league where a corner three-pointer is now considered a high percentage shot. With Brooks, success in the NBA goes beyond schemes and correctly executing plays. Remember his NBA journey started as undrafted free agent in 1988 with the Philadelphia 76ers, where he was befriended by Charles Barkley. Through hard work, he turned the opportunity into a 10-year playing career, including a championship ring with the 1994 Houston Rockets. The Wizards return a core group of players that have proved they know how to compete and make the playoffs. Along with Wall and Beal, the Wizards’ starting lineup will be the same as it was at the end of last season with Marcin Gortat, Markief Morris and Otto Porter in the front court. Gortat is coming off a career high with 41 double-doubles and went for over 1,000 points for a third straight year. Porter built on his emergence in the 2015 playoffs and finished with career highs of 11.6 points and 5.2 rebounds per game. Morris was a late addition arriving in February, but showed his ability not only as a scorer and rebounder, but a very effective low-post passer. The Wizards’ most notable offseason signing Ian Mahinmi suffered a knee injury in mid-October and at the time was given a four-to-six-week recovery time. With his previous team the Pacers, Mahinmi seized an opportunity when Roy Hibbert was lost to injury and showed defensive skills that made him an attractive free agent to the Wizards. On defense is where second-year player Kelly Oubre Jr. is expected to continue to excel. Oubre entered the league talking about his desire to play defense. It is difficult for a young player to back up that talk with action, but Oubre has proved to be a fearless on ball defender with the athleticism to produce the dramatic block or steal. Oubre joins a collection of young Wizards that Brooks will look to develop. Arriving from Utah is Trey Burke to back up Wall at point. After five seasons playing in Spain, 2012 Wizards draft pick Tomas Satoransky showed in preseason he is ready with bigger stage, and with deft ball handling skills at 6 feet 7 inches, he could prove to be a defensive challenge for opposing teams. As the Wizards go forward, they will do so with confidence in Brooks’ past. He became head coach of the Thunder early in the 2008-09 season. It was Kevin Durant’s second year and the start of Russell Westbrook’s career. Under Brooks’ watch, Durant and Westbrook improved, but so did players not as heralded at the start of their careers like James Harden and Serge Ibaka. Other teams reportedly were interested in Brooks, but he chose Washington. Now he gets to show why.